A comfort food classic with less guilt! 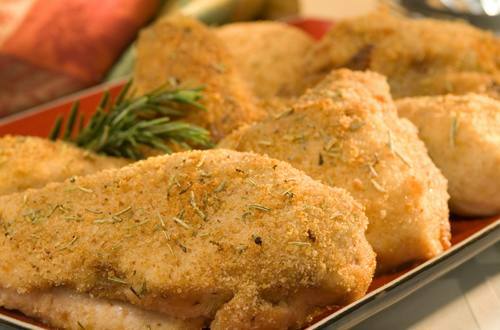 2 Combine bread crumbs, garlic salt, herbs and black pepper in shallow dish; set aside. 3 Add chicken and Hellmann's® or Best Foods® Mayonnaise Dressing with Olive Oil to large plastic bag; shake to evenly coat. Remove chicken, then lightly dip in crumb mixture. Arrange chicken on cookie sheet. 4 Bake 40 minutes or until chicken is thoroughly cooked.